My review is going to start with a premise that is also a chunk of advice for all future writers. If you’re going to borrow/steal, at least make it entertaining. The basic premise of Here, There Be Dragons, is the existence of a magical land (The Archipelago of Dreams) in which every land ever imagined or committed to pen exists and is in danger of falling under the command of the evil Winter King. So far so good. Everyone loves a great conglomeration of well-loved tales. What’s the problem? First, by “every land ever imagined or committed to pen,” I mean every British story that has persisted longer than half a century. Within the first few hours of listening, scenes/characters from Lord of the Rings, Alice in Wonderland, Treasure Island, Peter Pan, Narnia (though the fauns may have just been a Greek myth throwback), Sherlock Holmes and many other fairy tales marched across the plot-scape. One of main characters introduced wears clothing that is a mish-mash of every Hans Christen Anderson and Grimm Brother’s fairytale. Had I known that this was a metaphor-times-8-million for the rest of the book, I would have stopped right there. And admittedly, that may have been part of my problem: I really don’t like any of the stories listed in the paragraph above. If I had a deeper love for Brit lit, then maybe I would have found the references a little quainter. And maybe if the story had simply brushed by the other tales, paid them a passing tip-of-the-hat, it would have been like a delightful game of hide-and-seek to find your favorite Hobbit. But that wasn’t the case. But it wasn’t the “borrowing” that did me in. Recently, Mass Effect hit the video-game world with a bang and a spaceship. In this space opera, Commander Shepard fights off an invading band of uber-AI aliens while playing politics to the many races of the galaxy, most of whom hate humans simply for being whiny meatbags. When this epic scifi story got to the shelves, one thing became glaringly obvious: the game designer, BioWare, had plucked liberally from all of the great science-fiction staples: Stargate, Star Trek, Star Wars, Firefly, with some Space Odyssey and Asimov sprinkled in. 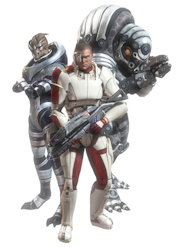 And for taking all those elements and splicing them into something original, BioWare created a phenomenon. How did Mass Effect manage to create a great, captivating story while Here, There be Dragons did not? I suspect the ability to shoot aliens has something to do with it. But surely the story borrowing wasn’t that bad, Meg. You just pointed out it can be done well. Our group of characters must get into a mountain pass where a dragon lives. But they get stuck at the front door because the way in is barricaded and can only be opened by an elvish magic word that the leader of the group has suddenly forgotten. Some of you may recall a very similar scene in Lord of the Rings: Fellowship of the Ring (especially since that is the precise place where there is a clear deviation of script between the theatrical and extended cuts — yes, I have seen them that many times). Shortly after that, they meet the dragon who begins to talk about how the real ruler of the Archipelago of Dreams must wear a magic ring. That’s right. A ring. Oh, and the elves and dwarves have special magic rings, too, donchaknow. 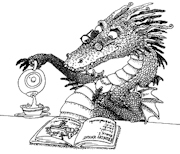 As soon as I hit that part, I was unenthusiastically waiting for the dragon to proclaim, “One ring to rule them!” It never quite got to that point, but it tottered close enough that I had to call the book dead as a DNF. Mind, I really love retellings of popular stories. Gregory Maguire’s Wicked remains one of my favorite books and Robin McKinley’s many forays into retelling famous fairy tales make a fangirl out of me. But what makes those stand out is the 100% commitment to the story. When Maguire wrote Wicked, it wasn’t about making fan-fiction nods to other versions: it was about reinventing a world that was already so well-loved that there was no choice but to go-big-or-go-home. In Here, There Be Dragons, the whole thing felt too tame, too contained. It was just not engaging in the way that Wicked or Mass Effect are. A retelling is about reinventing a loved story, not simply rehashing it. We have reviews and cliff-notes for that. About halfway through the audiobook, every time someone said/thought the word ‘dragon,’ my mind took a full-pelt sprint to my basement where Dragon Age II was sleeping in my Xbox. There be dragons there, too (and a whole bunch more theme stealing by BioWare, though this time from high fantasy classics). And in the game, at least, the dragons want to eat my face rather than serve me tea. Face-chomping dragons > Mildly British dragons. I may meander back to the book at some point. It’s not completely terrible; the novel is one of the rare instances where it is solely the story that kills the book, rather than the manner in which it is written. Hopefully Owens, who has a lovely way with prose, offers up something better in the next go around.